Next review Instaflex - Didnt you read the find print befor buying??? It is a scam. I didn't even receive the sample! This is a rip off. I agree with everyone that posted. I am going to try to get the credit card company to reverse the charges. I am not going to be ripped off and just sit back and take it. They have charged me for the sample and have the nerve to bill me for the first refill and the second refill bottle. Tell everyone you know not to order from these bilkers. They are out to take money from innocent people and give them zero in return. Review #181365 is a subjective opinion of User181365. 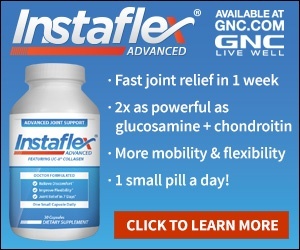 Your product is just a different packaging of "Glucosamine" and "MSM" at an exorbitant price. Please cancel any further orders. What I received is useless. You sent a first refill WHITOUT ANY ORDER from me and charge my credit card not telling me a word. This is not a good way to do bussiness. I have already called you tyhis morning and tried to get the charge removed. The person said I would have to send it back. How can I send it back, if I never received it? I have already called my credit card and it is under dispute. This is a scam. I am going to report you to the BBB. I never even received the *** you say you mailed. People like you should be locked up. We're sorry to hear you didn't receive your package. Most of the time if there is a shipment issue, it is because of a USPS issue or we have an incomplete address. If you could please contact us at 877-869-3310 or support@instaflex.com we'd be more than happy to help.